In this morning's Classic Elite newsletter are two free patterns for reversible cowls with cable stitches, knit with CEYarns' bulky weight Ariosa yarn, described as "soft and squishy" and obviously comfortable to be worn next to the skin, which is so important for an infinity scarf pattern or cowl. The longer cable cowl pattern caught the eye and is rated as easy. Knitnscribble, only recently charmed by Cascade's Baby Alpaca chunky weight yarn, was intrigued by the discovery of Ariosa, admittedly "a day late and a dollar short," yip-pee! another soft and luscious reasonably priced yarn for today's so popular quick knitting projects. Ariosa yardage per skein is 87 yards and gauge is 3.5 sts to the inch, knitting on a US 10.5 (6.5 mm) straight needle. Knitted flat, the cowl is knit as a scarf then sewn or grafted together, finished width with four cables per instructions is 5.5 in and 46 inches in circumference. If five cables are preferred for an odd number of cables, the cowl is knit in multiples of eight, so adding a fifth cable wouldn't be that difficult and would give the finished cowl a little more width. The infinity scarf pattern, as is, requires 3 balls of Ariosa, if adding a fifth cable, probably 4 balls of yarn. Searching for Ariosa yarn vendors online, knitnscribble found lots of pretty colors at WEBS Yarn Store, with a change in fiber content noted. 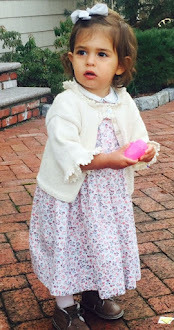 The original Ariosa was spun with Merino wool and cashmere. Later production skeins are available in 100% extrafine Merino wool. There is no distinction of which colorways are which content, so it's pot-luck when ordering the yarn. The WEBS reviews, only two, are mixed; one says the yarn comes apart, the other is quite pleased with finished results, so it would be interesting to know which fiber blend was used, if indeed, there is a different result dependent on fiber content. At WEBS, Ariosa sells for $11.50 USD per skein, and as one reviewer added, "affordable," which was also a part of the disagreeable review. Hum... wondering if that was the earlier production with cashmere content, and the reason for Classic Elite's change to 100% extrafine Merino. Knitnscribble would love to explore Ariosa. 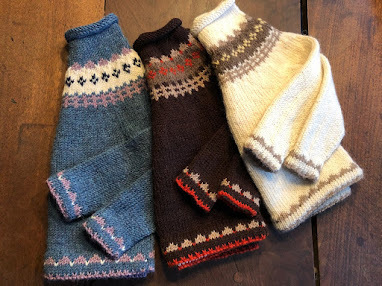 Cascade Yarns' Baby Alpaca Chunky for luscious cowls, hats, and scarves, was found over Christmas on Franklin Avenue, Wyckoff, New Jersey yarn shop, Close Knit. This yarn, also with a gauge of 3.5 sts to the inch on a US 10 (6 mm) needle, has 108 yards per skein, regularly $12.95 USD per loose skein and comes in a vast array of colorways: solids, heathers, and marled. The two free cowl patterns for knitting reversible cable patterns are generously posted by Classic Elite Yarns. 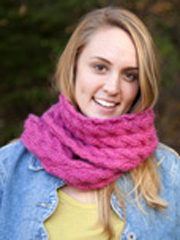 You'll find even more free cowl and infinity scarf patterns here to knit and crochet.